Shino, Alice and their friends are back for more silly adventures, and when you're friends with someone like Karen, then there's no telling what you're going to get into! Join the girls as they create stronger bonds of friendship in Hello! 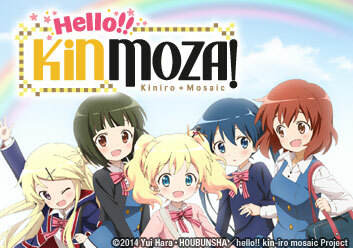 Kinmoza. Episode 1: Spring Has Come! A new school year greets Alice, Shino and their friends, but this year Shino and Alice have to be in separate classes. Later, Alice goes undercover to learn more about Shino. Shino invites everyone over for afternoon tea, but actually doing it may prove difficult. Kuzehashi tries her best to smile and be nice to her students, but smiling is hard. Yoko’s younger siblings show up at school, which upsets Yoko. Aya tries her best to get them to apologize. Meanwhile, Alice is missing her pet dog. Aya and Alice are tired of being mistaken for children, but as they nurse the flowers outside the school, they realize some growth only happens with patience. Shino’s older sister has been acting odd. The girls try to cheer her up by going out for a picture day! After that, Alice copies an old folk tale, which works almost too well. Karen suggests Yoko try a café’s parfait challenge to sate her sudden insane hunger. There, they meet a classmate, who ends up bonding with Shino over a shared interest. The seasons shift and Karen’s summer uniform is wild! Meanwhile, Shino, Karen and Alice have a surprise sleepover, and the girls hear a story from Alice and Karen’s past. This year, Yoko is determined to plan her summer vacation; she wants to go to the beach. But with summer also comes final exams! While Aya is creating a Yoko-proof summer homework schedule, Shino decides to change her look, which leads to dress up with Alice, Karen and Honoka. A great start to summer! The girls are finally headed to the beach! But alongside the cute swimsuits, tasty food and overall chilling, Shino might have a problem. Alice spends some time with Honoka before leaving for England with Alice. Meanwhile, Shino tries to cope with the two being away. Though Alice enjoys seeing her family once again, she misses Shino like crazy. Just as vacation comes to an end, Shino’s behind on her homework!